In September 2018, EPFL President Martin Vetterli announced the creation of the Open Science Fund to support the best ideas from everyone on campus with a total of CHF 3 million in funding over the period 2019-2021. The first call for proposal attracted nearly 50 propositions submitted between mid-September and mid-December 2018. Nine projects were selected by the members of the open science strategic committee along with representatives of the various EPFL schools. 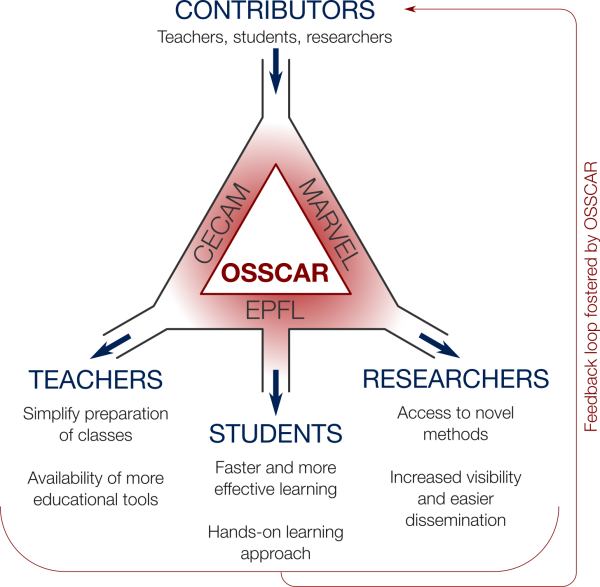 Funding for OSSCAR will allow the team to hire a post-doc to help create an open-science collaborative online hub that hosts simulation and data-analysis tools geared towards education and research. The developed tools, provided as apps, will feature interactive graphical user interfaces meant to be both easy for researchers to develop and deploy as well as simple for students to use and interact with. The team was motivated by the fact that while several EPFL courses focus on simulations, there is limited reuse of educational materials and technologies. This means that significant efforts are needed to set up computers with all software needed for each class, and this creates a burden for instructors as well as a barrier for students. The open-science environment that offers open software tools in the form of easy-to-use services that have little or no set up time should have numerous benefits: it should allow students to focus on scientific content from day one; instructors to reuse tools and adapt them into services with interactive interfaces to facilitate learning; and, finally, it means that tools can be organized in an such a way that it makes them easier to share between instructors at EPFL and beyond. It will also make them easier to improve collaboratively. The EPFL-branded content will be based on the MARVEL's Materials Cloud platform and it will be disseminated widely within EPFL and in the CECAM network. Based on discussions with teachers at EPFL, they will first provide some of the core tools needed for “computational thinking” in subjects such as physics, chemistry, materials science, and mechanical and chemical engineering. In the long term, they expect to use OSSCAR as a hub for other computational classes and research areas. To read more about the new fund and the other winners, please see EPFL's news release here.